In conjunction with a May Meeting Anniversary Celebration held several years ago a series of five short historical capsules were written to summarize various aspects of the history of the church. Four of the five capsules are printed below with the fifth capsule called “What Is A May Meeting Celebration” being found on the May Meeting page of this website. That meeting house is gone now but the cemetery associated with it still exists just three miles down the road just across the Brandywine. This was the original site for the gatherings of Baptist believers who would years later re-locate to our present site on Hephzibah hill. In the year 1810 the little village of McWilliamstown, located on the Strasburg Road, was witness to an event that at first did not appear to have much significance. But this event would eventually change the identity and the significance of this area. The small body of Baptist believers who worshipped in their recently built church (1792-1793) had decided to become independent from their mother church, Brandywine Baptist Church, located in Chadds Ford. Up until this time the believers who gathered at McWilliamstown were considered a daughter church of Brandywine Baptist. So, on May 20, 1810 the church located at McWilliamstown was constituted as an autonomous Baptist church. We have no record of how the church received her name but we do know the name that the church members agreed upon — HEPHZIBAH. This was definitely a unique name among churches. But, just like children’s names in the Bible which each had a special meaning, so too does the name Hephzibah. But, hopefully, Hephzibah’s bigget impact on the village and the surrounding area was not to be found in her name but rather in the proclamation of ‘The Name Above All Names’ – Jesus Christ. Phillipians 2:9 tells us “God who hath highly exalted him, and given him a name which is above every name”. It is our faithfulness to proclaiming the Gospel that will allow the name of Hephzibah to be most fully realized! 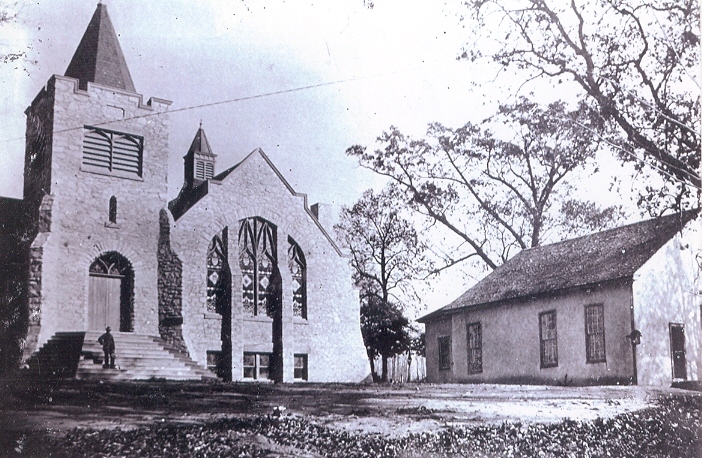 In the mid to late 1800’s Hephzibah served as both the spiritual and social center for the area. A number of successful revival meetings were held during these times as well as the annual May Meeting Celebration (starting prior to 1840) and the annual Harvest Home Festival. The following excerpts of newspaper articles appearing in the Daily Local capture the spirit and Spirit of these events. The most extensive revival ever known in this place has been enjoyed by the Hephzibah Baptist Church during the last two months. Meetings have been held for every evening for nearly seven weeks. Nearly 60 people have been made happy in Jesus, 53 have been baptized, and yesterday the Pastor received 51 new members into the church by laying on of hands, giving the right hand of fellowship, and an appropriate Scipture text to each one. It was a very pleasant sight to see so many, and most all of them young people too, take up the Cross to follow Jesus. The Spirit of God is still with us, and others are waiting to be baptized. The church is much revived and very active in the good work. To God be the glory! Yesterday again was the time honored annual custom observed of a general turnout at the old Hephzibah Baptist Church, in East Fallowfield township, termed the “May Meeting”. From every direction and by every avenue leading to that place, a throng of vehicles was seen from early in the morning until afternoon, when the current changes in the homewardly direction. It has been estimated that over 2500 persons were present, of which number not one sixth could gain admission into the little church. The May Meetings have been held from the earliest organization of the church, and really are its anniversary observances. In times gone by as high as six and eigth thousand people have been seen together on these occasions. The series of revival meetings commenced at Hephzibah Baptist Church, on Sunday, October 8th, is still progressing with rapidly growing interest. On Tuesday evening there were six aldults at the alter and others in the congregation who asked for prayers. The meeting did not break up until a late hour. The church is thoroughly revived. There will be an afternoon meeting next Saturday at 2 o’clock. There will be preaching every night while the interest continues as it is at present. The twentieth annual Harvest Home at Hephzibah grove will take place on Saturday, August 13th. These gatherings are truly grand and interesting. The grove is a delightful place, a cool breeze always stirring. The refreshment stands loaded with good things, the fancy tables loaded with the handiwork of the young ladies while the dinner and supper tables are always well patronized. Large fires light the grove at night. A band of musicians discourses music throughout the day. Several short orations are delivered, and the woods resound with song and glee. While the lads play ball in an adjoining field the ladies try croquet and tennis on the lawn. If you wish to enjoy a pleasant day don’t forget the Harvest Home at Hephzibah on the 13th.